These airbrush accessories from Iwata are key for to a superior airbrushing experience. 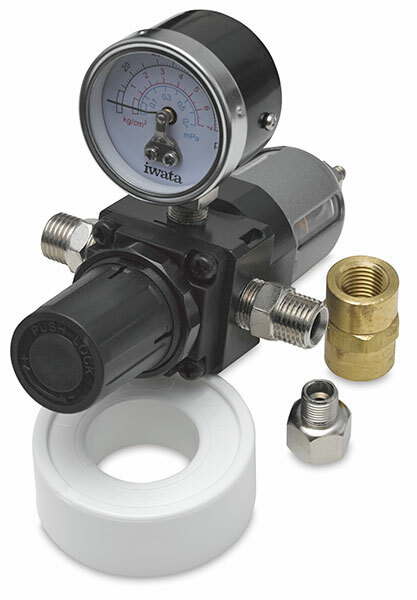 An air regulator is a device for adjusting air pressure, giving you more control as you spray. A moisture filter removes the water from air for a cleaner, drier air supply. 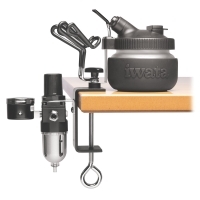 Create a complete workstation by also purchasing the Iwata Universal Spray Out Pot and the Iwata Universal Airbrush Holder, both sold separately. Pistol Grip Filter — The last defense against moisture! This innovative pistol grip filter attaches directly onto any Iwata threaded airbrush to deliver clean, dry air. Miniature in size, the super-fine, 5-micron filter element performs like a full-size filter separator. A built-in moisture release valve and a clear housing allow you to maintain your airflow without removal. Regulator DHCL — This regulator is essential for optimizing the performance of both the compressor and the airbrush. It can be attached either directly to the air source or can be placed inline between two air hoses. Moisture filter not included. Moisture Filter/Regulator F — This regulator with moisture filter is essential for optimizing the performance of both the compressor and the airbrush. It can be attached either directly to the air source or can be placed inline between two air hoses.